All holes are predrilled and all hardware is supplied with your swing, including chains and hooks! 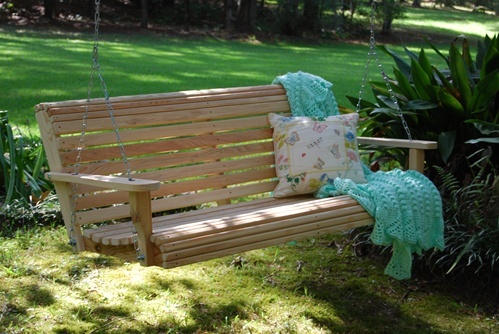 Cypress Moon Porch Swings take only 10 - 15 minutes to assemble! I. Remove from box and place as shown. III. Place riser (curved side out) on the bolt, then place one washer and one nut on and tighten. VI. After making sure everything is tightened, you're ready to hang and swing!